Dr. Cohen is a world renowned expert in the field of dentistry. He has served as the Dean of the U of PA., School of Dental Medicine, and Chancellor at MCP Hahnemann University of Health Sciences in Phila., PA. He is a Diplomate of the American Board of Periodontology (AAP) and maintains a private practice in periodontics. He has authored numerous textbooks and articles and has received numerous awards from all over the world. He has honorary degrees from Boston U, the Hebrew U of Jerusalem, the U of Athens, the Louis Pasteur U in Strasbourg, the U of Detroit and Carol Davilla U in Romania. He received the Gold Medal from the AAP and was only the third American to earn honorary membership in the British Society of Periodontology. The French government bestowed its Legion of Merit Award in recognition of his significant contributions to dental education in France. In 1997, the Hebrew U of Jerusalem dedicated the D. Walter Cohen, D.D.S. Middle East Center for Dental Education in Israel. 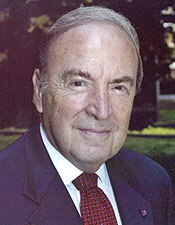 He currently serves as Chancellor Emeritus at Drexel U College of Medicine.